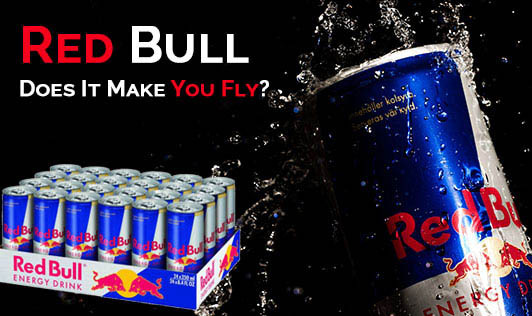 Red Bull - Does It Make You Fly? When one thinks about energy drinks, Red Bull is the first product which comes to your mind. So what is it that makes this drink so popular? Why is it sitting at the top of the energy drink mountain? Well, for one thing, it had a strong first product advantage; it pretty much started the energy drink sector. The drink is based on an original 1962 blend from Thailand known as "Krating Daeng", but eventually was reformulated in Austria and released in 1987. It was originally devised as a "pep drink" and quickly found popularity with those who needed to stay up late. Hence the slogan "Red Bull, Gives You Wings". There are 2 types of Red Bull products. There is a regular version and the other is the sugar free version (although the sugar free version hasn't taken off when compared to the original drink). Exactly what makes up a can of Red Bull? The ingredient list reads carbonated water, sucrose, glucose, sodium citrate, taurine, glucuronolactone, caffeine, inositol, niacinaminde, calcium-pantothenate, pyridoxine HCL, vitamin B12, natural and artificial flavours and colours. The total calories consumed are around 490 kcal in a 250 ml can, which is quite a lot of empty calories. This easily adds up to your daily calorie intake and surely your calorie consumption for the day goes for a toss. When we consider the contents, initially taurine and glucuronolactone were considered dangerous. But after proper research, according to The European Food Safety Authority (EFSA), it has been ruled out that there any side effects of taurine and glucuronolactone (which are added natural ingredients, also found in food). It is highly unlikely to have any side effects with interaction with each other and with caffeine too. As far as caffeine content goes, a can of Red Bull gives 77 mg per 250 ml can. This is quite high and when taken at odd hours can have a negative impact on the body. This can also be hazardous to people who drink red bull regularly. There are many side effects of consuming caffeine in excess; such as lack of sleep, irritability, etc and this in turn can cause disturbances in the daily routine. No wonder this stuff keeps you up at night! Children, especially, should not be exposed to such drinks at all. The amount of caffeine I just drank to write this review, I will obviously have a lot of time to think about the energy drinks tonight... when I'm not sleeping!